The LinkedIn Boolean Search Help article tells us, "If your search has two or more terms, you'll automatically see results that include all of them." However, this is not true in an exceeding number of keyword searches. You need to be aware of that, not to miss matching search results. #1. Your search is automatically restricted to the respective profile fields - Name, Company, or Title. #2. Your search is expanded to "synonyms". For example, a search for "James" may find people called "Jim" or "Jamie". 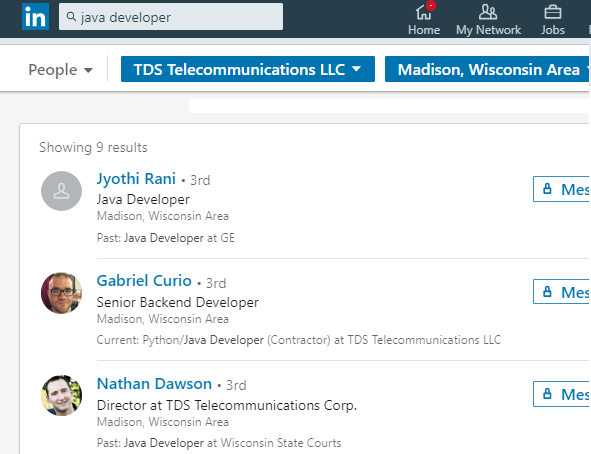 #2 - LinkedIn includes some people with similar past or present job titles - for example, Java Engineer. That's it - LinkedIn will not include, for example, someone who is a Developer and has a skill Java unless they match #1 or #2 above. The automatic interpretation of the search terms is not expected and not helpful. It's best to avoid it. Use common sense - does the number of results make sense to you or is it too small or too large? Use the advanced people search dialog and undocumented search operators.